The Nutriment JUST Offal Formula Complementary RAW Frozen Adult Dog Food is available in a 500g tub. 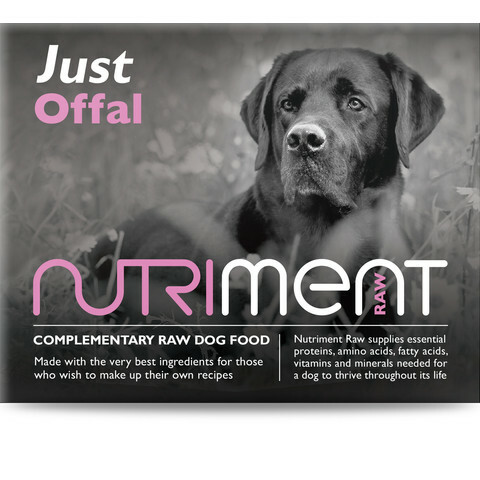 Nutriment JUST RAW Frozen Offal Formula is made with 100% offal, this complementary food is ideal for making your own DIY recipes at home. British Green Beef Tripe, Beef Heart, Beef Liver and Beef Kidney. Moisture 67.4%, Protein 15.0%, Fat 15.4%, Ash (inorganic matter) 2.3%, Fibre 0.5%.